Generally speaking, we tend to consider “institutional practices” and “individual practices” as diametrically opposed. Institutions constantly exert pressure on individuals while critiques of “institutions” by “individuals” are easily understood as a form of resistance or an expression of public opinion. Using “institutional critique” as an example, artists oftentimes use art programs and artworks to put “institutional critique” into practice, these programs and works gradually becoming a new model for institutional practices themselves. A detailed description of this dynamic can be found in Andrea Fraser’s 2005 article, “From the critique of institutions to an institution of critique.” If we observe everyday art practices, we surely can identify without any difficulty the interdependency between “institutions” and “individuals”; they are dialectically opposed and yet mutually influential. In terms of who should have the rights and responsibilities to define “art,” we of course recognise the significance of artists; not only are they the original creators of art, they also play a crucial role in defining art. We generally believe that through their creations artists can effectively define and redefine “art” from a first person perspective. The works of artists are a type of “individual practice.” In contrast, “the institution” of art is always considered an intangible concept that is too vast to be grasped in its entirety; it is an abstract operating system. We may imagine it through its concrete expressions such as art museums, galleries, art centers, and art academies, all of which are organisations intended to show artworks and distribute art information to the general public. However, artists, art critics, and curators must all rely on those distribution mechanisms such as themed exhibitions, topic symposia, and journal articles to publicise and communicate art to the masses. Therefore, through the process of information distribution, institutional practices play an even more crucial and influential role in defining art. This is certainly not to say that individuals do not exist within institutions; it just means that people who work within institutions are all transparent and anonymous. While this seems to demonstrate the difficulty of an individual exerting any influence on institutional decisions, this power dynamic is not necessarily one-directional or static. For those works that emphasise creativity and innovative ideas, individuals always have a certain impact on organisations. When Herald Szemann became an independent curator, he did so as a form of resistance to the institution of art since he was disgusted by the bureaucratic and conservative aesthetics and exhibition culture associated with the “institutional practices” of art museums. Now an exhibition culture with independent curators has in and of itself become a model within the institution of art. Inviting well-known independent curators to curate their exhibitions is not only a source of pride for many art museums and art institutions, but it also generates new ideas for their institutions’ exhibition culture. As a form of “individual practices,” independent curators were gradually integrated into the institution of art and consequently are no longer considered independent; however, they did effectively change “institutional practices.” Moreover, “individual practices” does not mean that they are done with any institutional consciousness. In order to effectively amass power and allocate materials, “institutional practices” require collaboration and coordination as their fundamental modus operandi. Since individuals only have limited capabilities, they need to assemble different forces in order to achieve their goals; thus, “individual practices” also rely on small organisations, resulting in the lowest level of institutional practices. In the 1960s and 1970s, artists-run art spaces and galleries emerged in the western art world as a result of artists resisting the institutional bureaucracy of museums and art galleries of that time while maintaining the mutually supportive nature of an artists collective. Unlike massive institutions requiring high operating budgets (including time and material), these organisations maintain an agile mobility similar to that of individual practices, resembling the SOHO-style corporate structure in the creative industries. These small art organisations are in effect critiques of institutional practices by individual practices and at the same time provide new directions for the current institutional practices. This issue has by and large been showcased in the Little Movements: Self-practice in Contemporary Art, curated by Lu Yinhua and Liu Ding, as well as in the 2002 Gwangju Biennale in Korea. This dialectical dynamic is not unlike the symbiotic and oppositional relationship shared by Neo, the main character of the film Matrix, with his host body. Neo’s resistance against his host body is at once a reactive and restorative act. Concomitantly, this kind of institutional restoration by individuals is an idealistic yet inevitable and recurring process. In his 2006 article, “Bureaux de change,” Alex Farquharson called attention to the phenomenon of “New Institutionalism” in the 1990s when some independent curators became the artistic directors of various institutions and brought into these institutions emerging art programs of the then popular “relational aesthetics” and participatory art, transforming an observation-based exhibition format into an occasion for audience interaction that includes workshops and on-site activities. In so doing, the new institutional practices anticipate a new round of critiques by, and integration of, individual practices before they dialectically develop in tandem. We can thus imagine some art programs that require social engagement turning to certain communities and calling upon the engagement of certain groups within these communities, which consequently will involve a discussion about, and presentation of, their history, daily life culture, and customs. In developed cities (such as Hong Kong, Guangzhou, and Taipei), local governments all fashionably deploy public participatory art programs to replace monumental public sculpture when they carry out projects to transform/re-develop the image of a particular community. At the same time, in the renewal cycle of community development, artworks become a way to pass down and preserve the community culture of the past (including daily life habits and stories of its history). Individual artists, such as the ones in the Hong Kong art group “Wooferten,” transformed an exhibition space into a community gallery where nearly extinct local culture and handicrafts from this small community were displayed for the public. Through the exhibition and its workshop format, bygone arts and crafts such as ceramic photo tiles, hand-painted black and white photos, and giant plaque wreaths for festivals were recognised for their historical value and contributions. Most folk arts and crafts originated from family-style craftsmanship designed to make a living; due to their limited market demand and inability to evolve into a Ford-style production model, it was difficult for them to be absorbed into a capitalist pattern of consumption. In vogue for nearly a decade in the Asian creative industries, the renaissance and preservation of folk arts and crafts has obviously been a declaration of resistance to industrialised production models and consumerism. In Asian cities’ increasingly popular creative markets, similar to the Arts and Crafts Movement in the West at the end of the nineteenth century, the emphasis has been placed on the relationship between personalised production and consumption in peoples’ daily lives, recognising the value of individual labor in the process of production and consumption. These creative markets are emerging due to the popular trend of creative industries; and in the name of creative industries, they in the end have fallen into a purely consumer-driven market category. Consequently, with new consumption patterns (such as workshops, interest groups, cultural exhibitions) replacing pure commercial sales in the past, these arts and crafts skills have been transformed into cultural activities in an artistic context and as a result have achieved wide recognition and lasting staying power. Art gives traditional arts and crafts added value, allowing them to survive in a capitalist consumer market; having said that, art practices also have to face up to the challenges brought on by the capitalist art market. In order to maintain their operations and expand their collections as well as attract a larger audience to sustain their appeal to sponsors and improve the effectiveness of their art education programs, art museums everywhere must rely on commercial sponsorship as well as the donations and support of collectors who have the power to influence the market. Therefore, corporate-sponsored classic exhibitions such as the Prada 24 Hour Museum in Paris; Gorgio Armani: Retrospective at the New York Guggenheim Museum; and the Hong Kong Museum of Art’s Louis Vuitton: A Passion for Creation, etc., have all been questioned as to whether they are pure support of art by the business sector, commercial promotions in the name of art, or even an excuse to endorse their products as art for the purpose of developing new lines of merchandise. Of course, art is itself both culture and a commodity. Nowadays, art expos have become one of the creative industries that attract international investment, replacing the role of biennales and triennials to promote local commerce and tourism. These previously mentioned phenomena all stimulate the rapid development of art industries and institutions in Asia; in addition, the advance of online information has prompted changes in the model of first- and second-hand art markets shaped by art museums, galleries, and auction houses. Furthermore, online auctions, artworks as stock options, as well as various art collection foundations and art money markets, all bring about changes in the circulation patterns of art collections but without improving artists’ economic rights such as artist resale rights and art programs’ minimum commission. Some private collectors no longer donate their collection to non-profit art museums; instead, they either establish their own art museums or collaborate with different art institutions and art museums to exhibit their collection all around the world, maintain their collection’s circulation, provide the general public access to their collection, as well as actively set and adjust the value of their collection. In Asia, these cases are not readily apparent, but they seemingly occur. In today’s weakened economic market and financial sectors in the West, the demand for Asian artworks has rapidly increased as objects of investment. This phenomenon is similar to the contemporary art market boom during the Western oil crisis and stock market crash of the 1980s. Like the Art Expo model, we still imitate the Western model; will we also follow the successes and failures of the West in the past, repeating the Western artistic life cycle? What role has the institution played in defining contemporary art? And where does individual practice locate itself in relation to institutional practice? In Southeast Asia the "institution," as in the non-commercial state-funded gallery, or the state-run biennale, has had a checkered history in terms of its nurturing of contemporary art. The situation varies a great deal according to country. In most regional countries, institutional support (or would-be institutional support) for contemporary art is either recent, or still non-existent. Philippines boasts by far the best developed state-funded institutional network of the region, though artists in that country may argue the system’s inadequacy on various levels. Most countries in Southeast Asia, and especially Laos, Cambodia, and Myanmar, provide no state institutional backing for contemporary art to speak of, so the question does not apply in these countries, where practices flourish despite any real institutional help. Thailand, and especially Singapore, however, are worth discussing since in these countries, the nature and depth of the provided support has some influence on developing practices. Singapore Art Museum opened in January 1996 and at the time seemed, in its collecting ambitions, nascent programmes, and exhibition initiatives, to be seeking to stake a place in the Asian/Southeast Asian contemporary art world along with Fukuoka and Queensland. State initiatives in Singapore’s contemporary art world, be they galleries or the Biennale (started in 2006) have a credibility problem because of both state censorship and institutional self-censorship that anticipates possible state censorship. Regional contemporary art, when independent, is often politically, socially, and institutionally critical, and so at odds with a socially conservative government wary of dissent. SAM’s opening display was a big Southeast Asian show and work by many of the emerging figures on the SEA art scene was featured. At the time, Singapore’s art community, and to a certain extent the regional art community, felt optimistic about SAM’s role as a nurturing home for the contemporary in all its diverse and experimental guises. It is important to remember the date of SAM’s opening: 1996 was the year of Apinan Poshyananda’s Traditions/Tensions (September), at the time the biggest ever SEA exhibition, and the first such initiative taken beyond the Asia/Pacific region; 1996 marked the second APT, considered by many as the coming of age of SEA contemporary; retrospectively, 1996 was also the peak of the Asian Tigers period, a time of great optimism for the region when economic expansion seemed to also promise political liberalisation. Within a year the Asian Financial Crisis, sparked in Thailand, would put an end to this optimistic sentiment in Singapore and Thailand. In Indonesia, the crisis accelerated political change, and the ousting of Suharto in May 1997 changed the country’s cultural scene very substantially. In Singapore economic factors rule every facet of life and even today, when culture and art are so much discussed and seemingly key aspects of city-state public policy, their economic attributes are really the only angles considered. Thus, after the eruption of the Asian Crisis, contemporary art was put on Singapore’s policy back burner for several years. SAM seemed to lose whatever good-will and momentum it had accrued after its opening and very quickly ceased to appear to have any particular allegiance to Southeast Asian contemporary art, putting up a plethora of exhibitions unrelated to contemporary practice in either Singapore or the region that did little to enhance the young institution’s reputation. Several serious, canon-aspiring Southeast Asian exhibitions (documented by research catalogues) were put up in the late 1990s, but these focused mainly on SEA modernism rather than contemporary art, the museum clearly preferring the safe distance of pre-1990s formalism and European derivation to the experimental and often politicised currents emerging across the region in the 1990s. From its early identification with current and contemporary regional practices, SAM quickly sought the safety of academic regional modernism. As a result of this quick change of allegiance, audiences and Singapore’s art community were confused. By the early twenty-first century, many Singapore artists were expressing negative views of the museum which was considered by a growing number as irrelevant to local practices, as well as an inadequate international representative of Singapore’s recent contemporary practices, never mind those of wider Southeast Asia. Artists as well as informed cultural players in Singapore regularly cited SAM’s lack of commitment to living artists and absence of curatorial rigour. During this period the museum continued to collect recent local and regional art but the public was not aware of the specifics of the acquisition guidelines or policy, and purchases seem to be made fairly randomly such that important and clearly seminal pieces by regional luminaries, despite very low prices at that time, failed to make their way into the national collection. Artists in Singapore seemed to be aware of this ad hoc approach to collecting and though some rather mercenary artists played to SAM’s increasing interest in innocuous, accessible, public-space sculpture, most, to their credit, quickly learned to ignore the institution and get on with their practices. Regionally, from the new millennium onward, SAM lost its early credibility and many non-commercial artists in Jogja, Hanoi, and Bangkok seemed little interested in the institution’s activities. Therefore, for at least a decade after its opening, save its inaugural 1996 show, SAM did little to define contemporary art in Singapore, or the region. Recently however, with SAM’s new directorship from 2009, and the creation of TNAGS (the National Art Gallery Singapore), SAM has been striving to re-invent itself and hence re-position itself at the centre of Southeast Asian living practice. The international and local market’s interest in Indonesian art, and this market’s surge in price, have probably had a lot to do with SAM’s renewed focus on the region. Several would-be canon-defining SEA shows have taken place since 2009, most notably a large modern and contemporary Filipino show put up in tandem with the Atheneo, an FX Harsono mid-career survey organised in collaboration with the artist’s gallery and for which early and seminal work was re-made by SAM, and the 2011 six-country SEA twenty year survey "Negotiating Home, History and Nation" which I guest-curated in collaboration with SAM. This last, more or less installed as proposed despite its heavy political slant, with its thick catalogue, illustrates the institution’s will to participate in the making of SEA contemporary art history. The recent Amanda Heng mid-career solo, probably the strongest to date of SAM’s series of exhibitions devoted to local contemporary artists, was a comprehensive presentation of Heng’s several decades of practice. The catalogue places her as a pivotal artist in recent Singapore art history so it would again be fair to say that SAM now aspires to be, or is effectively, canon-establishing. Because this institutional change of course is recent, it is probably too early to determine what effect SAM’s new engagement with living artists will have on practices. Because of SAM’s hybrid vocation as a museum championing Singapore as well as other Asian art (SEA, Chinese, Japanese, Korean, and Indian have all been showcased in the last three years) it is necessary to differentiate SAM’s influence on the practices of Singapore artists with any possible influence on those of regional/Asian artists. In Singapore SAM is uniquely positioned—along with TNAGS which appears, rather confusingly, as a rival—as the only institutional body supporting and acquiring Singapore contemporary art in any depth. However in the regional forum SAM’s position is less certain. Others beyond Singapore are coming to the fore as potential players supporting contemporary art from Southeast Asia, even if this interest tends to be nationally rather than regionally directed. Institutions in Hong Kong and China are now training their eyes on SEA art. The Fukuoka Museum of Asian Art, in the 1990s the strongest collector of regional contemporary, and still boasting the most authoritative research on regional practices despite slashed acquisition budgets, is still considered by a majority of regional artists the most prestigious institutional home for their work. Queensland Art Museum, with its APT, is also perceived regionally to have more credibility than SAM. However, the "Negotiating Home, History and Nation" exhibition did go some way to reminding regional artists of SAM’s original vocation and because a majority of works selected for the show were purchased by the museum, the museum’s commitment to collecting was re-asserted. However the works purchased were for the most part older pieces dating back to the 1990s so it is not clear that this bout of collecting will have influenced current artistic practices. As an institution of the state, SAM is still today perceived by some in Singapore and beyond as biased in its preference for safe, uncritical, or pseudo-critical art. Ethical, independent artists are not likely influenced by this perceived bias but some local and a few regional artists keen to sell to SAM have in recent years have appeared to make work expressly for the museum’s consumption. Though generalisation is impossible, many examples are characterised by slick visuals and tame, friendly sociopolitical content. In other words, the work harbours a critical veneer but is so conceptually poor or confused as to offend no one. Some critics in Singapore tend to glorify this art as they too can pretend to take political risks while effectively offending no one and taking no risk at all. In Singapore the glorification of ersatz political art is a national sport that would make for a very interesting academic study were it not so detrimental to the writing of a plausible art history of contemporary art in Singapore. But this is another topic that is related to Singapore’s cultural politics from the early 1990s, the city-state’s close involvement in the budding critical visual arts scene from the early 1990s onward, and control of performance art from 1995 . . .
Thailand has had a flourishing non-mainstream art scene since the early 1990s and boasts one of the region’s best internationally-recognised curators, Dr. Apinan Poshyananda. Yet to this day, Thailand has no state-funded gallery devoted to contemporary art. Thai artists started their battle for a contemporary art gallery over 15 years ago but have not yet succeeded in acquiring a dedicated public contemporary space as the coveted gallery morphed into the mixed public-private BACC. The Bangkok Art and Culture Centre (BACC) was inaugurated in 2008 but this is a city institution with no budget for acquisitions and a mixed exhibitions programme somewhere between gallery and community centre. Under new directorship since summer 2011, with some committed cultural players on the board, and as the only big public access space suitable for showing contemporary art in Bangkok, BACC must inevitably develop into an influential force for practitioners in Thailand and possibly the region. However, because of the institution’s relative youth, it would probably be premature to talk about BACC’s current role in defining contemporary art in Thailand and its place as a shaper of local practices. Does the discipline of contemporary art reside within the greater paradigm of visual culture, in the context of the region? Are the discipline of visual culture and its manifestations (art and visual theory) detrimental to the disciplines of art history, and contemporary art criticism? In the age of internet and total immersion in visual culture everywhere, it is difficult not to say "yes" to this question. However a recognition of this "yes" does not preclude a questioning of the sort of visual theory that some attempt to graft onto Southeast Asian contemporary practice. Beyond contemporary practice—as in beyond ahead and beyond behind—there is Southeast Asian art. The history of Southeast Asian art though hardly written, is old. My research of art in the region has taught me not only to relate and compare practices throughout Southeast Asia, but also to relate contemporary practices with pre-existing cultural information. A good part of my research is devoted to thinking about where the contemporary in SEA comes from and my conclusion is that unlike regional modern art of many decades ago, it is shaped predominantly by local conditions. In a globalised world outside influences merge with the parochial, but SEA contemporary is not an offshoot of practices elsewhere. If one believes in this indigenousness of the contemporary, it follows that any critical discussion of regional contemporary art should start in Asia and Southeast Asia, regional culture, history, geography, aesthetics . . . and wider Asian culture as key elements for understanding and analysing regional art and writing its art history. Western theory is not necessarily to be discarded but should be pondered critically in relation to the art it is supposed to be decoding. Because art historians and theorists of Southeast Asia tend to be trained in Western universities, they often try to apply Western theory to Asian art. And because they start with the discourse rather than the art, they tend not to actually look at the art they are reading. They therefore miss the clear mis-fit between practice and words. Contemporary Southeast Asian art calls for analysis in the context of a broader visual culture because it is rooted to begin with in a broad visual culture; but the understanding of that culture must start with local elements, widening out to include information from global sources. Are we trapped in a trope of "the contemporary"? The very presence here of this question raises the worrying idea that some are indeed trapped in the discursive side of the field, so forgetting to start with the practice. The precision provided by a definition or a single version of "the contemporary" can be reassuring but in Southeast Asia, where recent art history is still being written, and by many hands, there is the danger of limiting the discourse with definitions and their exclusions. Best then to avoid "the contemporary" and settle for contemporary in the much broader and ill-defined sense. In the context of Southeast Asia’s vast, plural, and rich terrain of contemporary practices, to be trapped in any sort of trope is to have lost sight of the art in favour of the tools used to decode it. How do folk and traditional practices inform or translate into contemporary practices? This is a big topic as artists around Southeast Asia mine village/folk vernaculars (mostly as opposed to court artistic expressions) and traditions in different and sophisticated ways. Traditional media, techniques, images, and forms are often used to translate complex ideas and make these accessible to wide audiences. Contrary to some pre-1990s practices, these vernaculars are not however resurrected literally and for their own sake, artists not going back to traditional languages, but rather moving forward using carefully-selected aspects of them as tools serving their ideas. Numerous essays outline the subject and rather than synthesise this important theme here over pages, I would direct the reader to comments in my amply-footnoted curatorial essay for "Negotiating Home, History and Nation" where I contextualise the topic within the wider field. Can the rise of institutions and the growth of the art industry within Asia endanger, rather than benefit, politically engaged art, an expression of individual agency that has emerged in the region out of necessity? This question deserves a nuanced answer and could be developed into a long research paper. But posed as a "can?" question, the quick answer is "yes." The danger the heated art market poses to socially engaged expression is not so much to that art’s existence, since typically many engaged artists produce art for the man in the street as opposed to collectors, but rather to engaged art’s visibility and public accessibility. In Indonesia, where the internal market for local art has been very strong for several years, socially engaged art now must compete much harder for gallery space since more commercially-viable artists tend to be favoured by art dealers keen to sell. Some established names associated with engaged practices still get shown, but it seems more difficult for younger, experimental social artists to find representation. The same phenomenon occurred in late 1990s Hanoi when the commercial art market there exploded. Suddenly the avant-garde, socially-inclined artists who had had space to grow and show—albeit facing the challenge of censorship—had to compete for viewership with artists whose works were not socially-challenging but commercial and decorative, so attractive to gallery-owners. As a result, some idealistic avant-garde Hanoi artists of the 1990s dropped out of the scene and stopped producing. Others changed their practices to make it more sellable. Others still changed their practices so drastically as to draw a very clear distinction between their own experimental and engaged expression on one hand, and the commercial art world on the other. In the case of late 1990s Hanoi, the rapid and indiscriminate expansion of the market had a clear negative impact on developing non-mainstream practices and because there existed no strong institution championing engaged or non-commercial art, this nefarious impact was not tempered in any way. The emergence of institutions can also affect the visibility or accessibility of socially-engaged practices. Here I understand "Institution" as a state-funded or accountable non-profit venue rather than a commercial one, though in some places in SEA, notably Indonesia, dealers set up non-profit “spaces” or “foundations” that serve to boost the dealer’s personal collection which is often one and the same as his commercial stable. Effects vary around the region—few countries in Southeast Asia today boast big contemporary art institutions—but it is true I believe that those few institutions that have come to the fore in the last decade or so aspire to canon-making roles. As a result, through their significant advertising budgets and programmes, they influence public perception about what sort of art is art historical. The issue with this is that exhibitions, particularly of critically-untested art, are put up with thin or non-existent curatorial justification. In other words, the essays—if any—published by the curatorium in the accompanying catalogue, often fail to tell audiences why the art on show is important and deserves space in the publicly-funded institution. This favoring of some art and artists should not necessarily influence the production of artists excluded from the list of institutional protégés. Yet since the institutions tend to influence collectors, and so commercial gallery-owners, artists outside the institutional loop may tend to adapt their practice to something closer to the "approved" institutional genre. This of course is true everywhere, not only in Southeast Asia. But the dearth of institutional support and multiple critical voices in the region is more likely to create a monolithic channel of "accepted" art that is difficult to counter. Institutions in Southeast Asia being supported by governments that are socially conservative, one can imagine that on the whole, institutions will tend to side-line practices that are experimental, political, sexual, etc. . . . The Singapore Biennale 2011 (SB3), remembered for its censorship incident as well, paradoxically, as for its uniformity, illustrates this point, while similar censorship kerfuffles have marred public exhibitions in Indonesia in the last several years. Some institutions do push boundaries however and so as exceptions that prove the rule, may provide encouragement to artists making art outside the mainstream. In Singapore the Substation has off and on over the years been a forum for alternative practices. The same is generally true of Singapore’s Esplanade, as well, more recently, and in fits and starts, as Singapore Art Museum. In Bangkok, the university art galleries can also play a role in showing alternative art, and the Jogja Biennale has cast itself too as an institution prepared to champion the non-mainstream and socially-engaged, which are often the same in SEA. If we must think about the “contemporary,” however, it is worthwhile to reflect upon the degree to which the study of contemporary Asian art constantly forces a reconsideration of assumptions; even the very phrase “contemporary art” can hardly be taken for granted. There is a surfeit of terms, all of which are deeply embedded in highly specific historical trajectories. The words used to produce the phrase “contemporary art” could be the same, but meanings vary considerably, as do their approaches to time. Gendai bijutsu, for example, is not the same as dangdai yishu, nor does it readily translate into hyŏndae misul. And gendai bijutsu as it was invoked in 1965 is not the same as gendai bijutsu in 1980. Then there are other definitions, like sidae ŭi yesul, literally meaning “art of our time” and used in 1930s Korea to refer to the aspirations of those seeking to make work that was relevant to the specifics of a given time and place. Others use romanised versions of the phrase “contemporary art,” a move suggesting that contemporary art itself as a Western phenomenon, or at least one heavily inflected by Western values. The plurality of definitions forces you to think about contemporary art as a heuristic impossibility because of its very imperviousness to essentialist thinking. You can’t think of a contained, standalone contemporary art, in large part because of these multiple definitions. Moreover, “contemporary art” becomes an impossible idea if you admit its contingent nature. So much of the discussion is really about trying to make sense of what has come before, or crudely put, “the past.” But how do you do this when there is still so much basic empirical work to be done, even in relatively affluent countries with a critical mass of interest in art? Since the early 1980s, South Korea, for example, has had an extremely robust artistic infrastructure with plenty of art schools, students, museums, galleries, and publications, not to mention a government eager to promote Korean culture overseas. And there are many scholars who work to build upon this. Yet there is still a good deal of basic historical information that needs to be done—birth dates and exhibition venues are missing or erroneously noted, artwork dimensions nowhere to be found, photographs improperly cropped, and whole bodies of work completely written out of the historical record. Part of this absence of a written history is the result of an incentive system that offers very few tangible or intangible rewards to art historians and curators. But the work is nonetheless crucial, for without it, can one really think about the contemporary at all? If we’re going to think about the “contemporary” as a history of contemporary art, then we’ll have to do some empirical digging first. The real concern, however, is that the idea of a viable contemporary art has to also be accompanied by some sense of criteria. What kinds of works are we willing to include in our histories of contemporary art? This is an especially pressing issue in many parts of the world, where the “gatekeeper” syndrome, in which a handful of commentators, particularly those able to speak, read, and write major European languages control, or mediate access to the art of a particular region, is especially strong. It seems churlish to fault certain parts of the world for this syndrome, particularly in those places where artworks are made and discussed at considerable risk to their creators’/discussants’ personal and professional well-being. Yet it is also risky not to think about the subsequent effects of this syndrome, particularly when an artwork’s market value is increasingly becoming the primary standard by which art is valued. In many parts of Asia, there is an almost insurmountable disparity between the power of the market and that of other institutions, including, but not limited to, the museum, the university, and even the state. Indeed, you wonder whether Ai Weiwei’s troubles with the Chinese state was actually a symptom of this disparity and the state’s attempts to reclaim some of the authority now wielded by a multinational market in which value is determined largely by consumer demand and very little by specialists in a given field. The one exception might be state-run funding bodies in affluent countries, including the ADC in Hong Kong, the NAC in Singapore, Arts Council Korea, or the Japan Foundation; these institutions have had some success in shaping what is considered “contemporary Asian art” by sponsoring exhibitions, artist projects, residencies, and the like. In such a climate, we can’t afford to mistake relativism for genuine tolerance, nor simply include all works without acknowledging the standards upon which such inclusion occurs. Logically, it is inconsistent to say that there is no basis upon which to consider something “good” or “bad,” yet write about, display, or buy some works and not others. It is even more inconsistent to say there are no standards, no criteria for judgment, for then you also suggest, by extension, that any illiberal or absurd position is likewise acceptable. Granted, it makes no sense to ask whether something is absolutely good; one discusses something as good in relation to something else. Yet there is also a need to clearly distinguish between the necessity of exercising caution when passing judgment and the wholesale embrace of an attitude tantamount to moral relativism. Likewise, there is a need to consider the practice of inclusion: although most people will strongly agree that the art world needs to be more inclusive/expansive, it does not also hold that most people will agree on what to include. Can there ever be such a thing as bad inclusion? I think so, especially when it takes place when those entrusted with the power of inclusion are not made to account for their choices. We all recognise the complexity of contemporary art, but the real challenge is actually having to confront it. Having said this, the notion of the contemporary, or rather of being contemporary (“contemporaneity”) can be very useful in rethinking the period commonly designated as the modern. Certainly it forces a different reading of time that compels a simultaneous acknowledgement of the synchronic and diachronic. This kind of reading is productive in rethinking artworks made in colonised areas, where it can be intensely difficult to think about artworks outside rubrics like “innovation,” “advancement,” and “the new,” rubrics that tend to position the artwork in a zero-sum battle between progress and obsolescence, or the condition of being avant-garde versus something that’s nostalgic. Perhaps most significant about the “contemporary” is the extent to which so many commentators are regarding it as an opportunity to redress the ills of past attempts at historicisation, hence the emphasis on keeping things open. It might thus be most useful as a symptom of what we hope to get out of art, or what we hope it will do. For this reason, it would be interesting to consider the exclusionary nature of contemporary art. Although most discussions of contemporary art stress its vastness, uncertainty, and ambiguity, usually in a positive way, there are whole areas that don’t get discussed, even now when anything supposedly goes: art intended to function as propaganda for an authoritarian regime, ink painting (other than as a source of “tradition”), copies, forgeries, and religious art, to name a few examples. When we talk about “contemporary art,” we’re really talking about a very tiny fraction of the world’s artistic production. What are we to make of this when “contemporary art” is increasingly periodised on account of its expansiveness and inclusiveness? One of the interesting paradoxes of contemporary art is that although there is no consensus on what it actually means, or on how to teach or curate it, there is nevertheless strong agreement of its existence as a field. In addition, the field loosely recognised as “contemporary Asian art” has great potential to shape the parameters of contemporary art in general. But the future of these contemporary art fields will depend on what we claim as its domain of inquiry, that is, on the questions we ask of contemporary art and how we purport to answer them. In short, the field depends on the moves we undertake on its behalf, now more than ever before. The over thirty respondents included the likes of Alexander Alberro, James Elkins, Okwui Enwezor, Grant Kester, Miwon Kwon, Pamela Lee, and Terry Smith. In a footnote, the October editors said they approached about seventy art critics, historians, and curators. Here’s the shocker: they only approached persons based in Europe and the US, because they felt that the questions, as formulated, were "specific to these regions." Seriously? Most respondents touched on the global nature of contemporary art. Here’s the irony: I’d wager that if you had included some Australian and New Zealand-based respondents, and while we’re at it, why not include some from Asia, South America, and Africa, well, then, my bet is that the kinds of responses you would get would be different from the existing 30-plus commentaries that October actually compiled, but they wouldn’t be that different—they would be perfectly recognisable. You wouldn’t have to publish separate volumes; the new compilation would be bigger, with more diversity, but it would still make sense as a single collection. So the claim “specific to these regions” seems a lame alibi, either belying a laziness or lack of curiosity—what’s the worse of the two, I couldn’t say. With the establishment of “contemporary art” as an institutional object, one has to negotiate the question of the global, even when one wants to insist on regional perspectives. So, given this global frame, how does one begin to answer the question of whether or not we should continue to teach and study art history as a discipline in itself, or merge it with that larger field called “visual culture”? There is, of course, a history, or rather, a number of histories of the emergence of visual culture as an institutional field. One could also look at specific institutions as case studies: for instance, The School of the Art Institute of Chicago, where I was recently a visiting lecturer, has both an “art history” department and a department of “visual and critical studies.” Both approaches are beyond the scope of my remarks here. Rather, I’d like to proffer a hypothesis about how art history as a discipline differs from visual culture as a field. Contemporary art may be characterised by a great plurality, but what also frames today’s art is what brings it together. One of the underlying premises of contemporary art is that one can curate art from any and everywhere, and exhibit it all together. This is what platforms like biennales do—hopefully with the aim of not just displaying this diversity, but prompting the different works to speak to each other. It makes sense to speak of art as a specific field, even if one can’t draw clear boundaries around it. Even if we do not have a unified, coherent world art history, what I’m arguing for is commensurability within this global pluralism, because our various multiple regional and local histories intersect or can intersect—and it’s platforms and institutions like biennales, art schools, and universities which encourage as well as manage these interconnections. “Visual Culture” may be something else. Perhaps it doesn’t yet designate a category so much as a whole universe of phenomena. Within “contemporary art” we have a great diversity. But within “visual culture” we may have great disparities. I suppose one way of differentiating the two terms is that with “diversity” there is commensurability, but with “disparity” there isn’t—not yet, at any rate. Do we have platforms and institutions that bring together the whole gamut of visual culture? What would a biennale of video games, contemporary art, popular tv shows, design, fashion, movies, magazines, comics, the list goes on and on—what kind of exhibition would that be? What would a university department that studied every visible cultural form be like? Of course, there already are departments of visual culture, but they don’t, as far as I know, attempt to encompass all of visual culture, rather, they make provisional expansions and conjunctions. I am not arguing that “visual culture” as a field of study is not legitimate or valuable. I’m arguing that “art history” is something else—it has its faults, it’s historically been far too conservative an enterprise—but it shouldn’t be subsumed by that larger field of enquiry. The Asia Art Archive Questionnaire is a timely example of the leadership role Asian scholars and institutions, including the Asia Art Archive, are playing in contemporary art debates. In the last two decades of dynamic change in the art world in Asia, where fluidity and mutability are the order of the day, the region has developed its own forums for art and created new cultural networks for the region and beyond. Are we trapped in a trope of “the contemporary”? What we are also witnessing today is not only geopolitical or economic resurgence in Asia but an Asian contemporary art drawing on cultures of thousands of years, the influence of which will inevitably become more and more evident this century. The contemporary context for that art is challenging. Geeta Kapur, one of the pre-eminent writers on art in the region, has described the context for many Indian (and by extension many Asian) artists, stating that art at the cutting edge of "community, nation, market . . . will differ from Western neo-avant-gardes in that it has as its referents, a civil society in huge ferment, a political society whose constituencies are redefining the meaning of democracy and a demographic scale that defies simple theories of hegemony. "4 Kapur also raises in this essay the issue of Asian diasporas. We need to consider when discussing contemporary art that many artists today are global travelers. At the 2007 Asian Art Museum Directors Meeting in Singapore, Okwui Enwezor referred to the important Bellagio conference of 1997 in Italy, which I also attended, and which discussed major recurring international exhibitions of contemporary art. This conference was a significant international event but there were few Asian representatives, although Apinan Poshyananda was a key speaker. That small number of Asian representatives would be an impossibility today because Asian art is now informing so many debates about art in our contemporary world. The conference took place in the context of the 1997 Documenta X exhibition, an intellectually fascinating exhibition but one in which, as a Latin American colleague pointed out, there were only a handful of Latin American, African, and Asian artists included. That situation of course has changed dramatically with artists from these regions seen more and more in the many world biennales as in Enwezor’s own Documenta in 2002. In 1993 distinguished Asian historian Wang Gungwu noted that: "The modern world has made people aware of similarities and differences among themselves to an extent never dreamed of in the past. Being thus more aware, people can never be the same again. "5 Globalisation has generated debates about differences, similarities, parallel histories, art histories, and art practices that demand multifaceted and varied responses. These are all good questions. They are questions that need to be answered in the twenty-first century by scholars, theorists, curators, and artists, and to necessitate more calibrated and infinitely nuanced discourses about multiple and changing art histories. It is as many scholars have noted not a simple case of centres and peripheries, local and/or global, and it is already clear that the landscape of contemporary art can no longer be viewed only in terms of a Euro-Americentric paradigm or the structures of Western art history. But these and similar questions have been and are being discussed in numerous forums in Asia—two examples being the many conferences over the last two decades of the Japan Foundation and the recent conferences around the Third and Fourth Guangzhou Triennales. Asian artists have also responded to the challenges required by new perspectives of history. Nowhere is this better illustrated than by Chang Tsong-Zung’s brilliant project, the name by which India was known in China from the time Buddhism came to China. The title "signals the invitation to encounter locations and histories across old and new borders . . . For China today, after a century of revolutions, it is critical to remind ourselves that in our imagination of the world there is not just the West, but also the West Heavens. "8 Indian and Chinese artists worked together in the exhibition, curated as part of the project by Chaitanya Sambrani, to explore links between the emerging superpowers. These were evoked impressively by Gulammohammed Sheikh in his imposing installation City: Memories, Dreams, Desire, Statues and Ghosts: Return of Hiuen Tsang (Xuangzang), mapping the historical onto the contemporary through the tumultuous reality of modern India. What is the role of the institution? Universities and museums as well as institutions such as Asia Art Archive play a vital role in these debates. We should accept that institutions, including museums, can be and are radical institutions in terms of social change and that exhibition models can encapsulate radical experimentation. The many curators who came together on the Asia-Pacific Triennial exhibitions I worked on for a decade saw it as a laboratory where ideas and the work of living artists could be debated in ways that were inclusive of the artists’ voices. Institutions are vitally significant, one hopes, in combatting the rampant consumerism and market-driven forces affecting the art world globally today. But institutions are complemented by the many artist initiatives, outside museums, or large institutions that are also sites of experiment and creativity. Examples include Sàn Art in Ho Chi Minh City set up in 2007 by artists, including Dinh Q Lȇ, for the benefit of Vietnamese artists whose work had been overlooked by political and commercial systems. One of the oldest such projects is Cemeti Art House in Yogyakarta, Indonesia, founded in 1988 by artists Mella Jaarsma and Nindityo Adipurnomo. Cemeti has always been concerned with issues affecting its local community, like the natural disasters of the 2004 tsunami and the 2005 earthquake, when the artists helped set up relief facilities and ran workshops for children. And another recent example in Japan is that in the aftermath of the 2011 Great East Asia Earthquake and Tsunami there are a multitude of art projects springing up in affected areas to assist communities to deal with the trauma of those events. Many of these projects are away from the great cities that increasingly characterise twenty-first century Asia. However, there are equally many artists who have looked at the urban city as a site for change. The Aar Paar project, for example, addressed the tensions between India and Pakistan and took place in Mumbai and Karachi in 2002. Ten artists from each city developed art projects by email which were then inserted in public spaces in each city, attempting to speak to ordinary people across societies deeply divided on historical, religious, and political lines and where the threat of war is an abiding reality. Focusing on the present helps us perhaps to believe we can put terrible events of the past behind us. As Jacques Derrida wrote of the twentieth century: "No degree of progress allows one to ignore that never before in absolute figures have so many men, women, and children been subjugated, starved or exterminated on earth. "9 Indonesian artist Dadang Christanto is one artist who has confronted these realities through his Count Project to count the victims of the twentieth and twenty-first centuries and to reveal hidden histories, including the Indonesian killings of 1965-1966 in which Christanto’s father was one of the hundreds of thousands of victims. Many artists in Asia today address the connections between art and social change through specific local, regional, and sometimes global perspectives. They also address contested ground in relation to history, tradition, religion, rapid economic, social, and political change, and the threat of violence and even war in the region and beyond. As I have argued elsewhere, in their passionate commitment to social justice, many contemporary Asian artists have explored ideas critical to all our definitions of humanity. 1. The discipline of history has accepted that "contemporary history" exists as a legitimate and necessary field of enquiry, something many international scholars of art history have resisted, preferring to see contemporary art as the domain of art criticism as suggested by some scholars answering the Foster Questionnaire. 2. Donald Preziosi, Rethinking Art History, Meditations on a Coy Science (New Haven and London: Yale University Press, 1989), 49. 3. Kishore Mahbubani, The New Asian Hemisphere, The Irresistible Shift of Global Power to the East (Public Affairs New York, 2008), 52. 4. Geeta Kapur, "Dismantled Norms: Apropos other Avantgardes" in Caroline Turner, ed., Art and Social Change: Contemporary Art in Asia and the Pacific (Pandanus Books, 2005), 46–100. This quotation p. 97. 5. Wang Gungwu, "Foreword" in Caroline Turner, ed., Tradition and Change: Contemporary Art of Asia and the Pacific (University of Queensland Press, 1993), vii. 6. Miwon Kwon, October 130, fall 2009, 3–124. This quotation p. 13. 7. Okwui Enwezor has pointed as an example of this to Patrick Flores’ groundbreaking project Turns in Tropics: Artist-Curator, developed for the 7th Gwangju Biennial which Enwezor curated. Enwezor, October 130, fall 2009, 33–40. 8. Chang Tsong-Zung, exhibition booklet "Introduction," unpaginated, 2010. See also: http://westheavens.net/en/ (last accessed 18 January 2011). 9. Jacques Derrida, Spectres for Marx (London, Routledge, 1994), 85. 10. Terry Smith, "Contemporary Art in Transition: From Late Modern Art to Now," 2010. See also: http://www.globalartmuseum.de/site/guest_author/298 (last accessed 12 March 2011). One of my starkest realisations about just how off-track popular vs academic thinking is regarding contemporary art came during a fairly recent visit to Manila by a British curator on an explo trip. It had been a quick pass through the city for her as most of these visits tend to be, but it had seemed she had been politely letting slide a quirk she’d noted even during lackadaisical exchanges she’d been in. Gingerly posing the question about how modernism was old hat but apparently still casually used interchangeably as a stand-in for “contemporary” in conversations she had had with artists and curators thereabouts, I attempted to assuage her that it really was much less about being ignorant of the debates about postmodernism and the posed temporality of contemporaneity, as it was about the existence of parallel universes and passionate assertions of altermodernities in these parts. So what’s this got to do with Asia Art Archive’s work and its articulated mission of stewarding memories of the inevitably turning past tense of this region’s contemporary art? Of course AAA brought this "soul-searching" upon itself by invoking Hal Foster and his "Questionnaire on the Contemporary" in the vaunted 2009 issue of October. But then one too would logically ask, what does AAA, sited as it is in one of the longer-standing capitalist cores of Asia, have to do with October and its hardly subtle political affinities? In a way this brings me to the incongruences cited by my British acquaintance literally passing through a locus of contending laggard semi-feudalist, postcolonial, arguably post-Fordist streams of living in the Philippines of this moment. As AAA inwardly checks itself against suggested categories of the individual and institution, it does so, too, summoning the fraught relationships between nowness and the global/local. As variably passionate claims and counterclaims get traded back and forth about what it is that constitutes our present—much of the debate has been about how the self has increasingly been given centerstage, how the seduction of subjectivities remain fascinating to scholars, and in some accounts, so much so that the thus less nuanced context-making of time and space have been seen to fade into the far, far background. Needless to say this triumphalism over microstories and the bio/personal is not shared across the board. The voices in October, however limited as the spread was perceived, still provided a compelling mix of a read. There was, for instance, Okwui Enwezor’s (after Chakrabarty’s) elaboration on heterotemporality, which argued against Foster’s conjured free flight while still suggesting a patently weak sense of fidelity to both territory and larger causes beyond the self—all this emanating from the contemporary artworld’s variably dispersed or multi-nodal sites of proffered autonomy and influence, and thus tending toward a knowledge domain strongly characterised by gradiations of difference rather than vapid generalisations. Terry Smith points, too, to this asynchronicity and strong sense of contingency. Thus, we could extend the logic perhaps and rather than look at contemporaneity as a trap, it may merely be taken as a state of affairs that needs minding rather than an ultimate surrendering to. As AAA, positioned as the archive that it is, continues to attempt to modestly do a "memory map" of a region, the contours of which are continually being debated, it might then consider being more given to flex amongst the sites that it desires to have its presence felt and build creatively from the variably successful work it has been allowed and enabled to do in states and non-state sites peopled by inequitably empowered artworld agents, weak cultural institutions, and stalled as well as fledgling capacity-building projects that impinge on domains ranging across art education to the more market-conflicted reaches of discourse production. I suppose my proposition here is to seek and occupy some productive space in which AAA might critically regard the contemporary. Grant Kester’s response to Foster’s taunt cited how the present state of affairs effectively constitutes artists themselves as countervailing authorities to the traditional gatekeeping art historian and critic. And I believe that suggests a place where AAA might be useful to those keen on tapping into its resources in working through their art and the discourse that gets built around it. My sense is that artists, and most anyone trying to keep in pace with the contemporary artworld, would hanker after a radar or at least some respite from the rabid nowness that the field is associated with. And that is precisely, in my mind, where AAA possibly fits. At the risk of giving myself over to some foolhardy romanticism, perhaps this is my pitch for a dreamt-of rooted stream of contemporaneity as a foil to Foster’s formulation of contemporary practice as a non-orbit. Joshua Shannon, in the same 2009 October issue suggests that this juncture provides a window for “a scholarship of specifics” which I would almost immediately associate with how AAA has literally made space for personal archives as hybrids of physical and digital traces. Further, T.J. Demos cites Appadurai’s notion of “imaginary landscapes” amidst uneven geographies manifested in the socio-political and cultural spheres. Johanna Burton (also in the same volume) tangentially suggests how debates surrounding the study of visual culture (possibly related to Kelly Baum’s notion of a "dis-identification with the discipline of art”) are tied into the sprawl of practices that have at one time or the other come under the problematic category, contemporary. Still in October, Pamela Lee writes of the attendant problems in relation to the “imagined historicity” of the contemporary. As someone recently subjected to having to sift through personal archives and fairly recent media accounts, digitised and otherwise, I feel for this latter point quite strongly. So much so that I would say that perhaps the charge to AAA in this regard is for it to actively participate in the re-imagining of history amidst its unfolding, historicising the otherwise inherently intractable imagination in full recognition of the fraught nature of this project. I’m wont to say that it’s a treacherous route to take but one that can not be opted out of. One of the distinctive features of Asian contemporary art is that these two questions cannot be answered in any regionally coherent way. (I'm going to talk about a kind of layman's Asia, not the Art AsiaPacific (or Asia Pacific Triennial) Asia that now encompasses the Middle East, has vaulted the Urals, and will soon take Kreuzberg.) As I see it, there are at least three distinctive worlds in which art institutions exert differing levels of gravity. One is specific to modern developed nations a certain way down the path to a post-industrial economy (led by Japan, and in its wake, Korea, Taiwan, perhaps Singapore). Second, we have the postcolonial developing world where institutions have been founded (or re-tooled) as part of modern nation-building programs (Thailand, the Philippines, Indonesia, . . .). And then, the yet to be institutionalised art-worlds of the socialist or post-socialist laggards (Laos, Cambodia, Myanmar, . . .) where stuff we find interesting and "contemporary" seldom if ever issues from institutions. The two big powerhouses, China and India, probably contain institutions (and lacks) we could associate with all three of these categories, as befits their vast scales and diversity and internally uneven states of development. The three types of setting come with different models of funding, bureaucracy, etc., differing levels of market development and openness, and not surprisingly, generate distinct modes of exhibition and collection. Some places have picked up the aesthetics and the rhetoric of "the contemporary"; some have not. I wouldn't want to make broad geographical statements about this—for now, these questions are best answered case by case, artist by artist, country by country. But I think it's worth noting that where the aesthetic discourse of contemporaneity (not necessarily implying the use of the term itself) has emerged, it hasn't always been by the same means. There is something we might call contemporaneity from below, whereby artists have devised aesthetic strategies for mediating between—and sometimes transcending—their local traditions and modernisms, and what they've seen abroad; and this has brought them into dialogue, and into circulation, with wider international currents. "The contemporary" has been the global, open-source discourse for lassoing many of these positions. There is also something like a contemporaneity from above, whereby institutions (including governments and the market) have picked up on this convergence and put themselves forward as champions and patrons of a local/regional "contemporary art." (In either case, this discourse of the contemporary is inextricable from a certain upswing in transnational flows of bodies and ideas.) In some places, both vectors are visible; but they don't necessarily always meet in the middle. Looking at the Thai case, which I know more intimately, I’d say it's squarely in the second (or "developing") category, notwithstanding the fact that Thailand wasn't formally colonised. The word "contemporary" (and its Thai cognate, ruam samai) has been around almost as long as the notion of "modern" art itself; the two terms were almost synonymous within the official discourse of academic art in the mid-twentieth century. Some of today's "contemporary" artists are still observant of this claim exerted by institutions over the present. Some are decidedly not. Their claim to the contemporary is often implicit, and consists in techniques, styles, and attitudes that are more postmodern with less hinging upon the national. This doesn't mean their work is less "Thai," simply that they are careful to avoid the aestheticisation and reification of Thainess, in which several generations of artist have already specialised. Within Bangkok's elite Silpakorn University, one can discern an institutional notion of the contemporary, though the Silpakorn mafia hardly seeks to be definitive about it. As elsewhere in the Thai bureaucracy, in order to survive there, the concept needs to be adapted to fit into with a worldview that's hierarchical, (at least outwardly) monarchist, patriarchal, and largely ignorant of the international industrial context beyond its own narrow horizons. As much as possible, such an institution seeks to maintain its station atop the institutional pyramid, but for artists working outside of it—and even some within—competing ideas of contemporaneity are bound to creep in. For the purposes of increasingly mobile young artists in the 1990s, institutions played a minimal role in defining what was contemporary. Independent initiatives were far more influential. Since the early 2000s, though, the state has been reappropriating the terrain of the contemporary—most obviously through the institution of an Office of Contemporary Art and Culture (since 2003)—and individuals have had to tread carefully, usually around institutions rather than through them, in figuring a contemporaneity that's legible and inoffensive to both local and international audiences. Charisma and kudos accrued in one sphere may be parlayed into the other in lucrative ways. Thailand's lack of market infrastructure means that the threshold tends to be guarded by a few power-brokers with currency in both international, and national-institutional spheres. Negotiating smooth passage between these two barely overlapping spheres distinguishes the most successful contemporary artists. But what qualifies their contemporaneity abroad is often quite different from what qualifies it at home. My answer to the first bit is a resounding yes. It does and it must. To ghetto-ise "fine art" or "contemporary art" in the region, to pretend it's not embedded in, and richly informed by, a host of other less exclusive cultural fields, would be to repeat the dumbest mistake of art history's history. But this makes the second bit tricky, because in my opinion, yes, the discursive activity branding itself as "visual culture" studies is in some cases quite detrimental to the development of historical knowledge and critical discourse on art. Genuinely "critical" contemporary art criticism has long been a threatened species, worldwide really, and never had much of a foothold in Asia; its prospects are dim. But art history is a beast that can serve many masters (market, academe, institutions, and states). The problem with the "visual culture" rubric is that it is often a workaround or shortcut that relegates the historical study of the visual to the margins. Cultural context comes at the expense of formal history, expansive referencing at the expense of focused analysis. This is less a criticism of "visual culture" itself as an intellectual framework and more a criticism of how it has been deployed in the reorganisation of higher education in the humanities. If "the visual" has a history, then surely art history must be central, rather than incidental, to that pursuit. For any decent humanities faculty, it's easy enough to cobble together an undergraduate module or minor programme in visual culture—its appeal to students is obvious (I’ve just done this in Singapore and the module was over-subscribed the very first time it was offered). Foreign and mature-aged students will queue up, cash in hand, for an MA. It’s fairly cheap to provide; (semi-) qualified staff are plentiful on the global academic labour market; synergies may be found with other divisions in the university. This sort of opportunistic construction is hardly surprising and goes with the neoliberal territory. In some places it's probably better than nothing. But it's telling that the drawcards that many such programmes boast are the new-age rockstar "independent curators" (often nomadic or based elsewhere) and not, by and large, serious critics or historians. They pump out plenty of anecdotal books about themselves and their jetsetting exploits, but everybody knows that proper research, research with historical purchase, is a slow business more suited to the sedentary life. The Ivy League people will tell you there's a big difference between their "visual studies" degrees and the new vogue for "curatorial" and arts management MAs. They’re probably right. But in this part of the world, the lines are blurred. And "visual culture" is often the substitute discourse—art history lite—that papers over the cracks in a one-year crash course. In my experience, graduates of these sorts of programmes (unless they had prior art historical training) are not well equipped for critical art historical or curatorial research. If Asia ends up with these kinds of programmes, without art historical ones, it will be to the great detriment of our contemporary artists and our societies. We should wake up to the fact that contemporary art is, at the end of the day, a fiduciary business, and that scholarship is a central pillar propping up its currency. Good artists know this. Good institutions know this. Good collectors know this. In a game of trust, there is simply no substitute for a methodical and relatively disinterested scholarship. The alternative—as we know only too well—is speculation, which isn't healthy for the artists or the investors. Are temporality and historicity prescribed based on territoriality? I’ll answer these together. Firstly, no, we are not trapped in a trope of the contemporary. In many places something calling itself "contemporary art" is still struggling to constitute and assert itself as a category of aesthetic production. In many parts of this region, it's simply invisible. But it may be true that international art discourse is trapped. At the Euro-American centre, renewed focus on the matter of contemporaneity seems largely a result of the expiry of the relational (I’m not just referring to [Nicolas] Bourriaud, but to a host of approaches to art and art-making of which "relational aesthetics" describes one small but conspicuous clump) as a candidate for what would follow the postmodern—a "presumptive replacement" for the latter, as Joan Kee and Patrick Flores recently put it. The idea that the relational might shunt us out of the postmodern is just as wishful as the idea that talking about contemporaneity will somehow get us beyond the problematics of relativism, networks, and globalisation. In any case, since you've characterised "the contemporary" as a kind of trap, I think it helps to specify a subject. It’s clear that the art historian needs it, especially as art history's pendulum swings back towards its linear Unconscious. (The Hegelians had been quiet for years, but the contemporary promise of a "world art history" has drawn even them out of the closet.) Judging from the growing discourse of the contemporary, it's clear also that the theorists and curators need it. But do artists need it? This is perhaps the more pressing question, and it's often overlooked. I can't answer it satisfactorily, except to say that I don't know many artists in Southeast Asia who care too much about the term, nor strive to identify themselves with it. In western art history, we can identify a certain contemporaneity avant la lettre—it's constitutive of the modern itself. Turner had it, this instantaneity that seems so proper to its age and yet, like any vanguard, was also somehow untimely. If the sense of contemporaneity inherited by contemporary art discourse (via Benjamin, Baudelaire, et al.) is to have any resonance for artists in Southeast Asia, I think it will be important to push beyond this dialectic of the un/timely. Linear time needn't necessarily be replaced, but it must be complicated by, entwined with, and filtered through the cyclical, the reversible, and the reiterative. Here in Southeast Asia, the links between past, present, and future are not just made of different stuff—language being the most obvious quotidian proof of this—but you can also do different things with them. Time-travel, remembrance, speculation, exorcism, political theatre . . . they're not the same everywhere, and nor is the amplitude of visual art. The secrets of its contemporaneity will lie in local cultural, political, and aesthetic histories, not in some "world" art history. Again, by way of example, let me describe the situation in Thailand. What does the notion of the "contemporary" mean there? How is it deployed, by whom, and to what ends? Its early use alongside the notion of "the modern" marked out something culturally different from the local, something from elsewhere. As modern art became more and more blinkered by questions of Thainess, especially since the 1980s, it probably makes sense that the matter of contemporaneity faded from view. Most of today's artists don't use it to describe themselves (any more than they use "Southeast Asia"); it's more a tool in the framing, rather than the practice, of contemporary art. Amongst the "framers," meanwhile—critics, curators, organisers, policy-makers, etc.—"the contemporary" is not a consensus, but an argument. It’s a struggle over what deserves to be promoted, celebrated, critiqued, and eventually remembered. Again it's unwise to generalise across Asia, as far as I can tell. The rise/growth of institutions and industry is neither good nor bad in itself. New York is full of art institutions, yet there's still heaps of interesting art being made and shown there. It can certainly threaten politically engaged practices, no doubt about it. But what matters is a) whether they're good institutions in the first place and b) whether their growth (like the proverbial mango tree) casts a suffocating shadow over the undergrowth. We could note the recuperation and gentrification of performance art in Singapore as a textbook example. It’s also important to note here that "politically engaged art" needn't always be an "expression of individual agency." Contemporary art in Southeast Asia has had it bourgeois-revolutionary moments when individuals became able to assert and exercise new-found democratic voices. And we've dialectical images to show for it. But in twenty-first century art, much of the energy comes from groups—and not just groups of artists, but also groups of curators, collectives, ad hoc and institutional, networks of non-art collaborators, groups of viewers and participants, etc. . . . I don't think institutions, where they grow, will threaten artistic expression and political engagement. Nobody expects these things from institutions anyway. The important question is how to build good institutions, staffed by professionals who know what research is and who can promote and above all defend contemporary practice. There will always be no-go areas for such organisations. That’s the nature of patronage. But it's not a problem if there are different sorts of institution, and different sorts of patron. Smith, one of the invitees and respondents to Foster’s original questionnaire on "the contemporary," has dedicated much of his research, thinking, and writing over the last decade to the topic of contemporary art, producing a number of significant publications on the topic, including most recently, his colossal undertaking, Contemporary Art: World Currents.2 For Smith, there is a shift in art practice in the latter decades of the twentieth century, which registers the transition from the “modern” to the “contemporary”; the latter standing for more than just a label to describe the art of our present times. Rather, what Smith and others are attempting to interpret and articulate is something decidedly different in the concerns and practices of contemporary artists which becomes more clearly manifest in the 1980s and is distinguishable from the modern art currents which came before them (roughly spanning the period of the late eighteenth century through to the 1950s). In particular, Smith interprets the difference of contemporary art through its attention to the world. Recent conferences, exhibitions, and publications undertaken by ZKM, the Center for Art and Media Karlsruhe, under the broader rubric of Global Art and the Museum, have also sought to investigate the meaning of contemporary art with "geography" at the forefront of such inquiries: “Where is Contemporary Art?,” for instance, was the guiding question of the ZKM’s symposia of 2007. * The shift from the question of "What is contemporary art?" to "Where is contemporary art? "reflects the sentiments of others that a constituent component of what makes contemporary art different to that art which has come before are the concerns and questions of geography and locatedness in the globalised art landscape. That contemporary art practice is a plural and differentiated project which defies a single universalist perspective. The logical extensions to these questions against the Asian context would be: “Where is contemporary Asian art?”9 And in my endeavours, more specifically, "Where is Southeast Asia in exhibitions of contemporary Asian art?" In my own work on contemporary Southeast Asian art over recent decades, I have grappled with articulating the distinctions and affinities of Southeast Asian art practice in relation to other contemporary art practices to be found in the global art landscape from the 1980s until now.11 Unlike the catalogue of nations which became a feature of the contemporary art biennales and triennales of the 1990s, my work has sought to investigate the possibilities and consequences of a "regional" view of art history—not one which assumes an essentialised Southeast Asia, but rather one that is necessarily seen as always shifting in its contours and scope, and also, in continuous dialogue or relation with both local and global histories and currents informing art practice. In other words, I have explored the significance of contemporary Southeast Asian art and artists and their place within the newly globalised art world and the field of "contemporary art," enfolded and refracted through the wider international visibility of contemporary Asian art since the late-twentieth century. This regional impetus and scope is foregrounded in the desire to probe the very constitution of contemporary art itself, especially within the context of "the global contemporary." In this sense, my work is an effort to reflect on the generative possibilities of Southeast Asian regionalism as a critical apparatus for forging more complex interpretations concerning the conditions and constitution of contemporary art and its developing critique and history, beyond the Euro-American focused models which once dominated art history. It is not only concerned to counter the omissions of mainstream (Western) art history, but also recognises the specific contributions of Southeast Asian artists and their cultural and aesthetic histories to our understanding of contemporary art. In other words, the new and diverse forms of avant-garde or experimental art in Southeast Asia which have emerged since the late-twentieth century are in fact constitutive of the very development and existence of that growing field of practice and study that we now call "contemporary art,"12 contributing to its formation and evolving definitions. Importantly, my attention to contemporary Southeast Asian art is informed by earlier histories of art from within the region itself, including its earlier international cross-currents. Of course, the idea of "Southeast Asia" continues to be debated for its parameters, significance, and critical possibilities. In my work I am attentive to the impossibility of describing contemporary Southeast Asian art in an all-inclusive, totalist frame while also addressing the local and personal contexts of art production which find presence in contemporary Southeast Asian art. In this sense, I follow the work of area studies scholars who argue the critical utility of "Southeast Asia," not as a fixed category of geographical reference, but as a “contingent device” for developing knowledge about the region.13 Paradoxically, regionalism continues to thrive in a globalising world and finds strong presence in the practices and discourses of contemporary art from regions such as "Southeast Asia," and larger ones such as "Asia," in which new contemporary art networks14 are being forged across national borders, as seen in the important work of Asia Art Archive. With the forceful emergence of contemporary Southeast Asian art on the international landscape at the close of the twentieth century, two long-standing impasses are finally surmounted: first, that locales such as Southeast Asia, once imagined as peripheral to the project of modernity and, therefore, perpetually and exclusively marked by practices of tradition, are finally recognised as significant contexts of modern and contemporary art production; and second, recognition that culturally cognate, and similar but different, processes and practices of modernisation, occurring in the West and elsewhere, activate different manifestations of modern and contemporary art. By this reckoning, the notion of "tradition" can no longer be regarded simply in an antithetical stance to modernity but rather must be seen as a constitutive part of what forges such modernity. In this vein, "contemporary art" must acknowledge the plural and manifold artistic practices of people the world over and recognise that the "traditional" may exist contiguously and even find presence in contemporary art and life.15 Thus, contemporary Southeast Asian art offers the potential of pushing the parameters of contemporary art more generally (the means by which we define it, including its modes, mediums, styles, and conditions of reception, among other formalist and affective considerations) so as to encompass those kinds of living "folk" or "traditional" art that are less readily translatable into the preexisting frames of international avant-garde art practices with their Euro-American inheritances and biases. The belated acknowledgement of Asia’s "living" visual cultures occurs after a largely exclusive, orientalist interest in premodern forms of Asian art such as Buddhist and Hindu stone carvings from Japan and Indonesia, traditional wooden masks and puppets from Malaya, Chinese ink woodcuts and calligraphic paintings, embroidered textiles of South and Southeast Asia, and ukiyo-e prints from the Edo and Meiji periods of Japan. Through the prevalence of these representations "Asian Art" becomes eternally anchored to a traditional past and continues to govern popular imaginations about "authentic" Asian cultures. In particular, Asia comes to signify the "primitive," the "timeless" and the "traditional." As Geeta Kapur remarked of the situation, “Non-Western nations, though struggling with the processes of modernization, are excluded from claiming modernism. Or they are seen as incidental to it.”16 Along with Kapur, a handful of other Asian art history specialists such as John Clark, T.K. Sabapathy, Redza Piyadasa, Patrick Flores, Apinan Poshyanada, and Jim Supangkat, paved the way in the late 1980s and 1990s for the recognition of modern art history in Asia, dedicating their work to redressing anachronistic perceptions of Asian art and asserting the unique and manifold developments of modernity and Modernism across the Asian region.17 Since the emergence of their important contributions to the field of Asian art histories, modernism has been recast not as an exclusively Western idea or phenomenon but one which is both born out of and influenced by Asian cultural currents. My research has also been attuned to the largely failed attention in much contemporary art scholarship to the aesthetic encounter in contemporary Southeast Asian art—that is, the acute attentiveness and sensitivity to formalist and affective considerations which lies at the core of art practice and its reception. These have often been overlooked in place of the hegemonic sociopolitical and culturalist discourses and ideologies prevalent since the late 1980s international attention to contemporary art outside Euro-America, particularly coalescing under the sign of postcolonialism. As a result, what we know about contemporary Southeast Asian art has been largely and sometimes exclusively guided by issues of ethnicity, politics, and cultural history, and less so by the art movements, aesthetic currents, and affective concerns which have informed contemporary art practices emanating from the region. This approach runs the risk of anthropologising the art object, reducing it to a mere mirror of Southeast Asian cultures. It also denies the possibility of forging distinctions and relations between contemporary Southeast Asian art and contemporary art produced in different contexts: what formal considerations of modes, mediums, styles, and conditions of reception, for instance, prompt us to be moved by contemporary Southeast Asian art in ways different or similar to other contemporary art? What is the relationship of such formalist and affective considerations to earlier practices and histories of art emanating from the region? What I am arguing for is a notion of "contemporary art" which also recalls the actual encounter with art as an affective and sensory experience of embodied relation. These relations are of course differentiated through the multiplicity of experiences that are possible in the embodied encounter with art (modes and milieu of reception, discursive frames, individual experience, etc.). Although such affect is often posited within the realm of "emotion" and "feeling," these encounters are not without real political influence and ethical consequence. As Meskimmon and Bennett (also speakers at our conference) have argued in different ways, art has the capacity to affect us, to move us to enact politics in the world.24 It enables a politics of transformation through the sensory response to art itself. Understanding ourselves as wholly embedded within the world, we can imagine people and things beyond our immediate experience and develop our ability to respond to very different spaces, meanings and others. Potentially, art is one of the most significant modes through which the cosmopolitan imagination emerges and is articulated. By materializing concepts and meanings beyond the limits of a narrow individualism, art enables us to encounter difference, imagine change that has yet to come, and make possible the new . . . Echoing Meskimmon, I suggest that in recalling the affective foundations for engaging with art we are also in a position to recognise both the particular generative contexts of contemporary Southeast Asian art, as well as its affective effect on all those who experience it—within, across, and beyond its regional borders, reflecting the intensely globalised practices and conditions of being-in-the-world which have marked humanity since the late-twentieth century. Certainly the particular significance of contemporary art is defined by new world currents and relations and the recognition of once peripheral localities in the constitution of contemporary art. However, in recognising the difference of contemporary art from Southeast Asia I am also, at the same time, suggesting its cosmopolitan connectedness to contemporary art from elsewhere with different contexts and influences of making. That as well as difference, there is a commonality and mutuality in contemporary art practice, its defining discourses and ideas, that reverberates in the global currents of contemporary art making and its reception and which asks us to respond to aesthetics with human sensitivity. In this way, contemporary art’s intellectual frame activates a space for considering questions of the particular and the relational, discrepant and intersecting worlds, and parallel flows of world-making in all its diversity. 1. Terry Smith, “The State of Art History: Contemporary Art,” Art Bulletin, vol. XCII, no. 4 (December 2010), 380. 2. Terry Smith, Contemporary Art: World Currents (London: Laurence King Publishing Ltd; Upper Saddle River, NJ: Pearson/Prentice Hall, 2011). 3. Smith, Contemporary Art: World Currents, 8. 5. Patrick Flores, “The Philippine Polytrope: Intimating the World in Pieces,” keynote paper presented at the Humanities Research Centre conference, “The World and World-Making in Art,” Australian National University, Canberra, August 11–13, 2011, unpublished. 6. Patrick Flores, post-conference summary for the Humanities Research Centre conference, “The World and World-Making in Art,” Australian National University, Canberra, August 11–13, 2011, unpublished. 7. Terry Smith, What is Contemporary Art? (Chicago: U of Chicago P, 2009), 151–152. 8. Terry Smith, “Currents of World-Making in Contemporary Art,” World Art 1.2 (2011), 20–36 (forthcoming). 10. See Patrick Flores, “Place and Presence: Conditions of Possibilities in Contemporary Asian Art,” unpublished paper presented at the 2002 Power Lecture in Contemporary Visual Culture series, The Power Institute Foundation For Art & Visual Culture, and The Department of Art History and Theory (University of Sydney), held at the Art Gallery of New South Wales, Sydney, 25 September 2002). 11. Michelle Antoinette, “Contending with Present Pasts: On Developing Southeast Asian Art Histories,” in Crossing Cultures: Conflict, Migration and Convergence, ed. Jaynie Anderson, Proceedings of the 32nd International Congress of the History of Art (Melbourne: Melbourne University Press, 2009): 870–874; “Images that quiver: the in/visible geographies of ‘Southeast Asian’ contemporary art” (PhD thesis; Canberra: Australian National University, 2005); “Drawing New Maps of Identification: Shifting Cartographies of Southeast Asian Art,” paper presented at the Our Modernities: Positioning Asian Art NowConference, Asia Research Institute, National University of Singapore, Singapore, 19–22 February 2004, http://www.ari.nus.edu.sg/conf2004/asianart.htm (accessed 8 September 2004). 13. See Heather Sutherland, “Contingent Devices,” in Locating Southeast Asia: Geographies of Knowledge and Politics of Space, eds. Paul H. Kratoska, Remco Raben, Henk Schulte Nordholt (Singapore: Singapore University Press, National University of Singapore, 2005), 20–59; and Sanjay Subrahmanyam, “Connected Histories: Notes towards a Reconfiguration of Early Modern Eurasia”, Modern Asian Studies 31.3 (1997), 735–762. 15. See Nicholas Thomas, “Contemporary art and the limits of globalisation,” in The Second Asia Pacific Triennial of Contemporary Art, ed. Caroline Turner & Rhana Devenport (exh. cat. ; Brisbane: Queensland Art Gallery, 1996), 17–18; and Nicholas Thomas, “Our History is Written in Our Mats: Reflections on Contemporary Art, Globalisation and History,” Asia–Pacific Triennial of Contemporary Art 2006 (5th APT; exh. cat. ; Brisbane: Queensland Art Gallery, 2005), 24–31. 16. Geeta Kapur, “Contemporary Cultural Practice: Some Polemical Categories,” in The Third Text Reader on Art, Culture and Society, ed. Rasheed Araeen, Sean Cubitt, & Ziauddin Sardar (London & New York: Continuum, 2002), 19. 17. On the subject of Modern Asian Art see: John Clark, Modern Asian Art (Sydney: Craftsman House G+B Arts International, 1998); Geeta Kapur, When Was Modernism: Essays on Contemporary Cultural Practice in India (New Delhi: Tulika, 2000); T.K. Sabapathy ed., Modernity and Beyond: Themes in Southeast Asian Art (exh. cat. ; Singapore: Singapore Art Museum, 1996); and Furuichi Yasuko & Nakamoto Kazumi eds., Asian Modernism: Diverse Development in Indonesia, the Philippines and Thailand (Tokyo: Japan Foundation Asia Center, 1995). 18. Ahmad Mashadi, “Southeast Asian Art During the 1970s,” in Telah Terbit (Out Now): Southeast Asian Contemporary Art Practices During the 1960s to 1980s (Singapore: Singapore Art Museum, 2007), 14–24. 19. See Raymundo R. Albano, “Installations: A Case for Hangings,” Philippine Art Supplement 2.1 (1981): 2–3; FX Harsono, “The Installation as the Language of Social Concern,” in conference papers of The First Asia–Pacific Triennial of Contemporary Art: Identity, Tradition and Change: Contemporary Art of the Asian Pacific Region (QAG, Queensland Cultural Centre, South Bank, Brisbane, 17–20 September 1993; Brisbane: Queensland Art Gallery, 1993); Julie Ewington, “Five Elements: An abbreviated account of installation art in South-East Asia,” ART and AsiaPacific 2.1 (1995), 110. 20. See essays by Iola Lenzi and Tan Boon Hui in the accompanying exhibition catalogue for Singapore Art Museum’s 2011 exhibition, Home History and Nation: Two Decades of Contemporary Art in Southeast Asia 1991–2011 (Singapore: SAM, 2011). 21. See Caroline Turner ed., Art and Social Change (Canberra: Pandanus, 2005). 22. See Ahmad Mashadi, “Southeast Asian Art During the 1970s,” in Telah Terbit (Out Now) Southeast Asian Contemporary Art Practices During the 1960s to1980s (Singapore: Singapore Art Museum), 14–24. 23. Patrick Flores, Past Peripheral: Curation in Southeast Asia (Singapore: NUS Museum, National University of Singapore, 2008); and Patrick Flores, “Turns in Tropics: Artist-Curator,” in Annual Report: A Year in Exhibitions, Okwui Enwezor ed. (Gwangju: Gwangju Biennale, 2008). 24. See Jill Bennett, Empathic Vision: Affect, Trauma, and Contemporary Art (Stanford CA: Stanford UP, 2005); and Marsha Meskimmon, Contemporary Art and the Cosmopolitan Imagination (London & New York, Routledge, 2011). 25. Marsha Meskimmon, Contemporary Art and the Cosmopolitan Imagination (London & New York, Routledge, 2011), 6. Why do we want to talk about “the contemporary”? Because we are witnessing the formation of “contemporary art” that is not merely current. (If it were, then, every era has had its own share of contemporary—read: new—art). Without necessarily acknowledging it, we sense something special is happening in front of our eyes and we long to articulate it. The issue of “the contemporary” or gendai has informed my study of post-1945 Japanese art almost from the beginning. Two essays of mine—“Historicizing ‘Contemporary Art’: Some Discursive Practices in Gendai Bijutsu in Japan” (2004) and “‘International Contemporaneity’ in the 1960s: Discoursing on Art in Japan and Beyond” (2009)1—in particular represent my effort to examine the art critical discourse about gendai and the concept of “international contemporaneity” in 1960s Japan, when gendai bijutsu (literally “contemporary art”) became institutionalised as an extension of “avant-garde” (zen’ei) art. It is my contention that 1960s Japan serves as a paradigmatic site of world art history, not only because of its artistic importance as one of the major battlegrounds of postwar vanguard art worldwide but also its critical implications. A vexing nature of world art history or transnational art history is language—because, needless to say, the lack thereof constitutes barriers beyond one’s familiar languages but, more fundamentally, because language defines how we think. Although people have already started talking about contemporary painting, as opposed to modern art, they just make a distinction from kindai what has become a matter of fact. However, kindai is not merely a style-concept [yōshiki gainen]; it constitutes a value-concept [kachi gainen], underlined by an intense consciousness and sensitivity ofkindai first recognised by Baudelaire. Almost five decades after this text was written, today Miyakawa’s call for the discourse of gendai sounds more relevant than ever, as we confront the issue of the contemporary and contemporary art. Following his contention that kindai at once concerns “style” and “value,” I argue that the current state of art in particular and the world in general demands to conceptualise “the contemporary” as both “style” and “value,” which are “underlined by an intense consciousness and sensitivity” of today’s world. In the world of art, the discursive articulation of “style” is a basic concern and we have developed a gamut of ideas and terms to deal with “contemporary art.” However, how about “value”? Have we even begun to articulate its “value” (which I take Miyakawa to have meant a set of conceptual, critical, and theoretical perspectives)? Speaking of “value,” what is the parallel for “contemporary” that “modernity” is for “modern”? Granted, “contemporaneity” signifies the quality or state of being contemporary. However, this noun has to perform double duty as the noun form of both “contemporary” and “contemporaneous,” the latter more matter-of-factly meaning “existing, occurring, or originating during the same time.”4 Although I have probed the critical and methodological depth of “contemporaneity” as “being contemporaneous” in my study, I must admit it is at best confusing to have to use one noun for these two adjectives that are complementary yet of different critical weights: if two given works are contemporaneous (i.e., made at the same time, chronologically speaking), they may not both be called “contemporary art” (art critically speaking). Yet, “being contemporaneous” in a broad global context indelibly marks “contemporary art” and our engagement with it. The Japanese language is here again useful, having two different words for two different concepts, dōjidai (the state of being contemporaneous, in the same era) and gendai (the state of being contemporary). I can think of a few theoretical merits of this neologism. Above all, “contemporarity” underscores our sense of living in a world fundamentally changed from that of modernity, which has gone on for more than one century. If History with a capital letter “H” may have famously ended and “contemporarity” could not happen without modernity, history did not end with modernity, as we continue to live in contemporarity that is part of historical unfolding. Currently, contemporary art is often discussed in the context of the globalising art industry—the globalised art market and the international exhibition circuit of biennales and triennales. However, homogeneity characterises the state of art far less accurately than that of economics. The industry’s globalisation often prompted intense localisations of some practices, as seen with community-based contemporary practices that have proliferated in Japan. (One such example is Inujima Project by Yanagi Yukinori, a poster child of the globalising art world with his The World Flag Ant Farm , who eschewed the commercialisation of contemporary art and returned to Japan.) In other words, we need to understand contemporary art in its state of contemporarity between “global” and “local,” “transnational” and “national.” Local inflections continue to mark contemporary art as with modern art. If we now examine modernism in terms of multiple modernisms and alternative modernities, don’t we also have to consider contemporary art in terms of multiple and alternative contemporarities? Indeed, multiplicity and heterogeneity are two hallmarks of contemporary art. As applications of contemporarity, two questions attracted my attention among those posed by the archive. The pitfall of “the contemporary” is its ahistoricality, so long as we are bound by its “present-ness.” Since contemporarity is the state beyond modernity, by definition, it is a historical and historicised concept that should allow us to deploy all art-historical and other historical tools we have developed to study modernity, even though their mindless application is certainly dangerous. Furthermore, as with modernity and modern art, different temporalities and historicities of contemporarity and contemporary art are informed, not by any means “prescribed,” by local disseminations and inflections. While the territoriality of Eurocentricism may be as strong today as decades ago, its sense of territory has since been fragmented by the very diversity of contemporary practices. By conceptualising our sense of time as contemporarity, we may be able to offer a fresh insight that will liberate us from the stricture of modernity. It is important to remember that even though we may have a general “standard time(frame)” of modernity vs. contemporarity, that will be complicated by many “local time(frames)” or assorted local clocks that mark time differently. But as a whole, the time differences, so to speak, are dramatically more closed up in contemporarity than in modernity. Ultimately, this is a project larger than art, but art appears to prompt us most acutely to expand ourselves in our thinking. 1. “Historicizing ‘Contemporary Art’” was first published in Positions 12.3 (Winter 2004), 611–641; and reprinted in Contemporary Art in Asia: A Critical Reader, ed. Melissa Chiu and Benjamin Genocchio (Cambridge: MIT Press, 2011), 295–325. “‘International Contemporaneity’ in the 1960s” first appears inJapan Review, no. 21 (2009), 123–147 (http://shinku.nichibun.ac.jp/jpub/pdf/jr/JN2103.pdf). 2. Linguistic discussion is complicated by the interchangeability of “modern” and “contemporary” in English: post-Newtonian physics is called gendai butsurigaku (contemporary physics) in Japanese and “modern physics” in English. Furthermore, different meanings of the same 現代 have been conceptualised in different cultures using Chinese characters. 3. Miyakawa Atsushi, "Anforumeru igo" (After Informel), Bijutsu techō, no. 220 (May 1963); reprinted in Miyakawa Atsushi chosakushū (Writings by Miyakawa Atsushi), vol. 2 (Tokyo: Bijutsu Shuppan-sha, 1980), 17. The use of French in translations are from the original Japanese text. 5. In my study of twentieth-century collectivism in Japanese art, I have already encountered a similar problem: the sense of gendai bijutsu which was firmly established by 1970 in the art world is now replaced by kontenporarī āto, literally “contemporary art,” underscored by the globalisation, turninggendai bijutsu into a thing of the past in many ways. See Tomii, “Collectivism in 20th-Century Japanese Art：An Introduction with Operational Observations of Dantai” in Collectivism in 20th-Century Japanese Art, guest-edited with Midori Yoshimoto, Positions (forthcoming in 2013). The story goes back to five years ago, when I first came across the Swedish sinologist Cecilia Lindqvist’s publication China: Empire of Living Symbols. This book once again illuminated to me the trans-temporal quality of hieroglyphs, as well as the over-consumption of words and writing which so plague our current reality. It also became clear to me that amidst the rapid changes that China undergoes, we are forgetting history at an incredible speed. 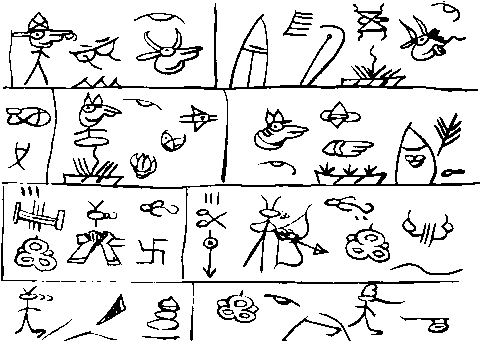 By a stroke of chance I recently discovered the mysterious celebration of hieroglyphs preserved in the Dongba culture, which allegedly harbours the only surviving hieroglyphic system in the world. Indeed, the Dongba hieroglyphs face the danger of becoming a touristic commodity; nonetheless such a development does not overshadow their vitality and charm. Before there were any writing systems, figurative and abstract representations were the medium through which humankind communicated. The histories of such images lurk beneath the characters we now use—these images are the subconscious "lingua franca." Instead of treating hieroglyphs as writing, we may as well see them as new spatial prototypes. While the "immediate interaction" enabled by the hieroglyphic form promises a whole new imaginative horizon, it simultaneously demands attention to their content. Hieroglyphs not only embody an urgency to express, but also assert an autonomous status as a poetic language that refuses to be consumed. Our present time may be one where pre-historical silence meets post-historical (consumed) silence. Existing expressions never suffice. In the current state of affairs, are we not desperately questioning the crisis in human beings’ inner worlds and the illusion of ourselves as the sole centre of the world? This concept has not only prevented human beings from communicating with the world, but also deterred our interactions with the self. When space becomes denser than the scale of humanity, it in turn oppresses our living space. Should we not then return to pose this basic question—how can human senses sculpt the body of a space while allowing all that happens within to shape ourselves at the same time? When interaction becomes an alienated economic act instead of a mutual coming together of hearts, should we not consider breaking down the "bubble economy" of language and returning to the direct contact of everyday life? Should we not probe the question of how the expressions and interactions of an individual can influence the everyday’s perception and thus extend its universality? And also the signal of reconciliation between the world and us. Notions of the “contemporary” and “contemporaneity” have made most of the noise in the art world over the last decade, in particular with the Euro-American institutions that dominate global “air time” for art. Public museums look to the contemporary to keep themselves relevant and their collections alive. Art fairs and auction houses may make more money on Picasso and Warhol, but they too look to contemporary art for their expansion and future prosperity—a strategy they share with the commercial gallery sector, with its front room contemporary shows and back room modern dealing. But I would argue, that in relative terms, it has ever been thus. Where things are markedly different is the new emphasis on contemporaneity in the academy. This is (at least partly) driven by the recognition that art has become what the cultural theorist Irit Rogoff describes as an undisciplined field: one where disciplinary boundaries are irrelevant and violated as a matter of course. The other engine for growth for the contemporary—across the academy, and both institutional and commercial sectors—is the diverse sources of economic growth in the world. Contemporary art is no longer, to borrow former Director-General Greg Dyke’s description of the BBC he took over, “hideously white.” The academy wants young lecturers to teach its students about Chinese and Indian art; the museum wants to partner with regional institutions, recruit adjunct curators and hire advisory groups to grow its collections and accumulate knowledge; the larger Euro-American galleries have become one-stop shop department stores, carrying exotic new brands for a geographically expanding clientele; and more and more collectors now pursue collecting with the same discipline, drive and global ambition with which they developed their businesses. And if wealth creation is increasingly in the East—the nucleus of the art world will of course shift eastwards. Witness the rise of Hong Kong as an auctions market and as host to outposts of the world’s largest commercial galleries. Again—it has ever been thus. In this context I think it is incumbent on us to ask what role “institutions” need to play in Asia. Indeed it is imperative we try and develop a vision for what such institutions should be. But perhaps it is simpler to start with what they should not be. For me, they should not be about achieving instrumental aims of redevelopment or tourism—a legacy of the Bilbao effect that has become a chronic and global affliction. They should not be about trying to build me-too collections of global brands or Turbine Halls for grand, and often grandiose, artistic gestures. In Asia, I think, we need institutions where buildings come last. In that vein, I would like to champion two different roles for institutions in Asia. One is the creation of knowledge. This knowledge may still be centered on the contemporary (we do inhabit that moment so can be forgiven for wanting to privilege it), but would anchor this focus on the here and now within an arc of history. Aiming at an understanding that is not hagiographic, essentialising, or reductive, but one that allows whispered histories to rise to the surface. To operate within the realities of Asia today—such an institution or rather such a role would not need vast collections of objects or a well-stocked academic faculty. But would need to be able to access and leverage both in a flexible way. I see something more akin to Wikipedia than MoMA. My other plea would be to build institutions or programmes that can provide some source of support, solace, validation, or recognition for artists other than that provided by the market. I see artists from art infrastructure poor countries vacillating between the lure of the market and the treadmill of “vehicular” (as opposed to vernacular) art that can be consumed with ease on the global circuit of the biennial, and the region-focused show. These are not pipe dreams, for I can see aspects of both these roles in numerous programmes operating in Asia today—East, West, and South. The government-funded Sharjah Art Foundation runs both an annual platform of knowledge exchange (the March Meeting) and a newly established production programme that it has de-linked from the Biennial; the corporate-sponsored Abraaj Capital Arts Prize shares a $1 million annual prize between five artists from the Middle East, North Africa, and South Asia region to realise new projects chosen by a changing jury from hundreds of artist submissions; the nearly 50-years old government funded Centre for the Study of Developing Societies in New Delhi has created an institutional space to support interdisciplinary research on a diverse range of contemporary issues; Hong Kong’s non-profit Asia Art Archive has built a flexible and potentially wide-reaching base from the seemingly narrow focus of documenting and sharing contemporary art practices in Asia; and in the Istanbul-based SALT, a corporate-funded institution has created an innovative platform for research, where the exhibition is a means of enquiry as well as display. The ingredients for the institutions we need in Asia to build knowledge and support critical artistic practices can be found in many of the programmes mentioned above. We need the vision to stitch them together, and the fortitude to let them grow at their own pace. The institution is significant in a generic way. In the Indian context, institutions that devolve around the social sciences have probably had a role in shaping the contemporary. The contemporary in India has its roots in institutional critique, especially the cusp of movement from the modern to post modern practices in the late 1960s and early 1970s. State institutions of art—and their rejection thereof by the Indian avant-garde artists—actually provided the provocation for the movement into the moment of the contemporary. How does the discourse on contemporary art reside within the greater paradigm of visual culture, in the context of the region? The discourse on contemporary art is simultaneous with the principal "actors" of the street—religion, politics, and Bollywood. Indian social polity is intensely visual; everything shares a free-floating domain of mobile images. Contemporary art draws, refutes, satirises, documents, mimics these players of the field. Probably not in a broad discursive way but in the narrow sense of the art world and its limited circuits of exchange, yes. This is complex. As with any postcolonial society, history and politics have actively provoked, galvanised, and patronised the arts. (The arts in turn have critiqued them and built a super-structure of discourse precisely on such public instruments). Temporality is I believe critical. I am persuaded that India for instance is in a second Asian awakening, if you like, the first being during the 1920s when Sun Yat Sen, Okakura Tenshin, and Rabindranath Tagore drew up a shared and idyllic vision of pan-Asia. The present Indian consciousness of Asia in the arts is not so romantic. There is a cynical understanding of the market model of Chinese art, but there is also a genuine desire to de-link from the intellectual and critical dependency on the West. Since the mid-1990’s, Japan and the APT circuit became active Asian interlocutors. These provided serious curatorial dialogue. Now China seems to provide new possibility. South Asian art within the region—with Sri Lanka, Pakistan and Bangladesh is also a shared and increasingly familiar framework, with common themes of terror, politics, gender issues, etc. Issues of censorship in the arts are also shared. Folk and traditional have different layers of engagement. The "collaboration" with tribal artists, the contemporary interpretation of the miniature form and its divergent development in India and Pakistan. However the relationship between modern/contemporary and folk—tribal/traditional is an old and unresolved tension. The institutions that are emerging in India are a handful of private museums and the new art fairs which also enter the discursive space. These spaces do tend to blunt the edge off political art, but they are also catalysts to divergence and difference.